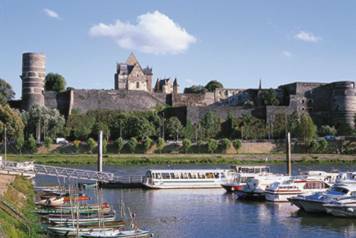 Set in the heart of the region Pays de la Loire, and very Europe-minded, France’s 17th city enjoys a good reputation as a desirable place to live. 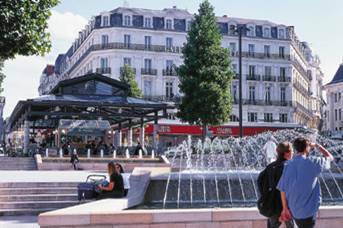 According to the Express magazine, Angers even offers the highest quality of life to its residents compared to other big french cities (septembre 2012). • Population: 147 571 (City of Angers in 2010), 283 000 (Angers Loire Métropole urban area of 33 municipalities). • 300 km from Paris, 90 km from Nantes, 110 km from Tours. • High-speed rail: 1hr30mins from Paris, 3hrs 40mins from Brussels, 4 hrs from Lyons, 5hrs 45 mins from Marseille. 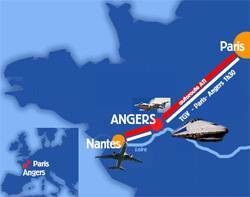 • Angers Loire Airport: flights to London, Tunis, Palma and Nice. • 24 city bus routes and 1 tramway. • Education : 107 pre-schools and elementary schools, 20 secondary schools, 17 colleges, 2 agriculture schools, Angers city institute. • Culture : Le Quai (Public institution of cultural cooperation), CNDC (National Centre for Contemporary Danse), NTA (New Theatre of Angers- National Dramatic Centre of Pays de la Loire), Orchestre National des Pays de la Loire (ONPL), Music Conservatory, Fine Arts School, Le Chabada (Current Music Scene), Company Jo Bithume, 5 museums, 3 theatres, 3 cinemas, 10 libraries, 24 leisure centers for children.